The issue of plagiarism has been in the news often lately, most notably within the music industry, and there are many "blurred lines" when it comes to referencing or paying homage versus copying or knocking something off. When is it OK for designers to reference another's work, and when might it verge into the territory of knocking it off? ASID members from across the country gathered in Washington, D.C., this week to hear from leadership experts and thought leaders during the 2nd annual Design to Lead Summit on April 13. Keynote speaker Don Blanchon, executive director of the Whitman-Walk Clinic, told attendees, "Make the right decision every time, even when it's hard." During the ASID Legislative Symposium, April 14-15, ASID members participated in the Society's first-ever Hill Day, bringing interior design's message straight to lawmakers on Capitol Hill to discuss the economic impact of the profession and issues such as building codes, energy efficiency, resiliency, and health and wellness. Both events saw attendance nearly double from last year. Watch this space for a recap from both events. 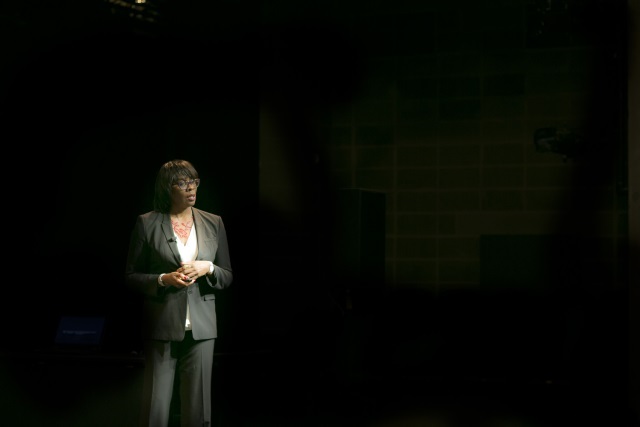 Toni L. Griffin, founding director of J. Max Bond Center on Design for the Just City, challenged attendees to not limit themselves to what "others" define as their scope. 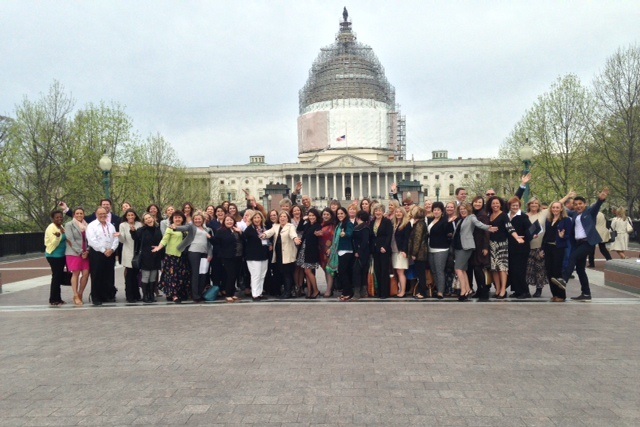 ASID Legislative Symposium attendees stop for a photo at the U.S. Capitol before meeting with legislators from each of their home states. Benjamin Moore has the perfect paint for any project. Check out our calendar of events for exciting events in New York, Florida, Los Angeles, Virginia, Maryland and Wisconsin. The High Point Market Authority (HPMA), in association with ASID and sponsored by Horchow, will present the popular Design Viewpoints Series, April 17-21 at the High Point Theatre. Don't miss the special session, Reigniting the Fire Within You: Purpose and Passion in Design, on Sunday, April 19. Then, join ASID and Natuzzi that evening for a "Society Soiree." Join us in North Carolina; learn more about the events awaiting you. Join ASID at this exclusive event to celebrate the Society’s 40th anniversary and to honor the individuals and organizations that are transforming lives through design. Tickets available in mid-April. More information to follow. Join ASID and Steve Nobel of NOBELINKS in Charlotte for an exclusive ASID Accelerate Studio event on April 30. The workshop series features six IDCEC-approved sessions that focus on topics to help interior designers build successful, sustainable businesses. Attendees can participate in the full-day program or choose sessions a la carte. Register today. ASID Career Exchange at ICFF — a new Student Day program. Both events have been designed to make the most of the educational and networking opportunities available at ICFF. Join your peers at the Jacob K. Javits Convention Center in New York in May. The ASID Foundation provides scholarships and awards to those dedicated to advancing the profession of design. Applicants are awarded financial assistance for their outstanding work in interior design research, behavioral science, business practice, design process, theory, and more. Awards of up to $5,000 are available for undergraduate students, graduate students, and educators, and both ASID members and non-members can apply at no cost. Apply today — deadline is April 30. Elections for the 2015–2016 ASID Board of Directors are underway. Have you cast your ballot? Voting is easy: Simply visit www.asid.org and log in to your "My Account." From the My Account drop-down menu, click on "Society Elections," and follow the voting instructions. If you would like a paper ballot, please contact Keri Kohler at 202-675-2345. Voting ends May 15. HD Expo is the premier trade show and conference for the hospitality design industry. Presented by Hospitality Design magazine in association with ASID, the conference showcases the newest and most innovative products and services and provides inspiration and networking opportunities for hospitality professionals. ASID will introduce two can't-miss events during this conference! Learn more. Register for an ASID REGREEN Workshop near you this spring to learn how to provide environmentally-respectful interiors through design. The REGREEN Implementation Workshop is the nation's first and most comprehensive green residential remodeling program. Join ASID at Dwell on Design in Los Angeles and earn CEUs from more than 18 ASID education sessions. Use promo code ASID to save $10 on tickets — register today. Dwell on Design, curated by the editors of Dwell magazine, returns to Los Angeles May 29-31. This exciting event brings together the best products, services, and thought leaders in modern design for a series of exhibitions, conversations, education, and more. Don't miss this event. Learn more about Dwell on Design. Imagine What's Possible. Design with a Greater Purpose. The Daltile Interior Design Scholarship, presented by the ASID Foundation, challenges applicants to select a charity or non-profit to take on as a pro-bono client and to explore the design issues the client faces within their current location. The goal is to transform the space into a high-functioning, beautiful environment that addresses the client's needs while exhibiting design excellence and creativity. The Daltile Interior Design Scholarship awards more than $25,000 in prizes, and is accepting applications through April 26. Learn more. We are living in a time of gender revolution. Traditional masculine and feminine roles are being challenged through advances in science and technology, and by cultural shifts stemming from the evolution of sexual politics and media depictions of gender. Identity is no longer clearly defined as female or male, but by increasingly visible manifestations of sexuality or lack thereof. Designers, who should focus a critical eye on society's issues, need to work within this discourse to help promote acceptance and change. The American Institute of Architects released the latest Home Design Trends Survey, which polls residential architects on what is increasing and decreasing in popularity in the industry. The most recent survey, released in April, focuses on trends in kitchen and bathroom design. In the April issue of Interiors & Sources, ASID National Chair Stephanie Clemons writes about how spaces can move us in profound ways. They can fill us with awe and wonder, enchant us with their delicacy and beauty, or overwhelm us with their magnificence and magnitude. They can send our spirits soaring or enfold us in silent serenity. Beyond their aesthetic and practical functions, beyond their sense of place, spaces have the potential to address our deepest human needs. When we think of spaces in this way, they take on a whole new dimension. Interior Designers of Canada (IDC) has partnered with Milliken for a new award that highlights the achievements of Canadian researchers in interior design. The Interior Design Research Award will recognize individuals who demonstrate excellence and innovation through interior design research, including that conducted at the master's or doctorate level, and through major projects by final-year students. As the war for A&D talent continues to intensify, firms may struggle to fill positions and hire the right people. But a new Harvard Business Review article suggests that may not be caused by a talent shortage. Instead, it might be because your firm's approach to compensation hasn't evolved to be effective in today's rapidly changing talent market. Many homeowners will head to the Web when they feel the need to unleash their rants against your business, mostly because they feel there's no other way to have their voice heard. That's why it's a good idea to proactively reach out to customers to collect their feedback on a regular basis. This gives you the ability to better plan your response, and ultimately improve the quality of your dealings with angry customers. Whether retail or to the trade, the quantity versus quality comparison remains high on the list of binary choices for the buyer to make. For retail purchases, there is so much out there of lesser to medium grade quality — allowing the buyer to purchase more items and often items that are in stock — so it's a tough "time and money" conversation to compete with. If you are selling high quality at retail, you need to be prepared to raise and discuss this issue as part of the selection process… and it's always better to be the one who initiates this discussion. Remodeling yourself is the biggest remodeling job you will ever do. Like remodeling a home, often the best work is done with a trained professional assisting. Candlelight, soft music, a bottle of wine, roses. A romantic dinner for two? These days it could just as likely be a romantic bath for two. For some time now homeowners have been transforming their bathrooms into refuges — a place for privacy, relaxation, and reflection. Now there is a growing trend toward turning the bathroom into a romantic hideaway where couples can spend some quality time in luxurious surroundings. An unexpected headboard may be exactly what you need to kick a bedroom up a notch. More homebuyers are starting to think snagging a "smart home" is a smart move. But for many of them, it's one thing to say they want "smart features" — and another to figure out which ones are really worth it. When recent studies show the average cost of a new bathroom has risen from $175-$225 per square foot to more than $600 per square foot, designers can assume consumer tastes have grown finer. Still, while everyone may want and deserve luxury, not every budget passes the test. Designer Christopher Grubb offers some tips for creating sumptuous bathroom environments for a variety of clientele. Are the best buildings those that are designed with green materials and minimal energy usage in mind, or are they the existing ones that have stood the test of time and may be adapted to new needs? Renovation, of course, is aligned with the latter option. But it raises a number of important questions about how to renovate sustainably. As new troves of data from Houzz indicate, it also raises a number of questions along generational lines. The world's top-performing companies are prioritizing sustainability as part of their corporate social responsibility efforts, and a majority of them are using LEED to achieve their goals, according to a new survey by the U.S. Green Building Council (USGBC). Of the respondents, which encompassed 48 of the Fortune 200 companies, 96 percent use LEED to support their sustainability efforts. Nearly all (93 percent) reported that demonstrating a commitment to the environment motivates their company to use LEED. What if building codes actually required new projects to enhance a certain number of ecosystem services — such as sequestering carbon, building topsoil, enhancing pollination, increasing biodiversity, or purifying water and air? These were the big questions biologist and biomimicry expert Janine Benyus posed during her keynote presentation at the recent International Living Future Institute's 2015 unConference in Seattle. Optimizing the value of space is about using the available space in the best way possible to achieve optimum results. In essence, this means merchandise needs to be easily visible and accessible, but in an environment that also creates a positive shopping experience for the customer. There are four key principles of design that must be right before space optimization can be achieved. "Acoustical comfort" is achieved when the workplace provides appropriate acoustical support for interaction, confidentiality, and concentrative work. The foundation of acoustical comfort in the office is the Privacy Index (PI). There are three key areas of equal importance that need to be addressed to create acoustic comfort: behavior, design, and acoustic treatment. Innovation is thriving in healthcare settings across the country as providers work to support better ways to deliver projects and design healthcare environments. By researching and implementing new ideas, as well as continually improving on previous advancements, hospital and health system-based innovation centers are shaping the future of healthcare delivery. Presentation software and hardware technologies allow instructors to make lectures and classroom discussions more engaging and interactive while sharing important content with their students. Educators, when properly equipped with the right tools, can easily present multimedia files, handwritten slides, Internet information, and scientific data. A millennial business traveler perceives travel as an opportunity to conduct business and also explore the environs during these trips. This generation values speed and convenience on their excursions. They prefer to book hotel rooms at companies that uphold a concern for the environment and institute companywide sustainable business processes and practices. They seek instant gratification, search for services and ambient conditions they deem "cool," and any unique non-cookie-cutter experiences they can share with their virtual communities.